Reed Hanes opens on the mound for Greenville in 9-1 scrimmage win over Russia. RUSSIA – The Greenville varsity baseball pitching staff combined on a 1-hitter while the young team was playing error free ball in defeating the home standing Russia Raiders 9-1 in a Tuesday night scrimmage. Greenville took an early 1-0 lead in the top of the second inning with Tony Sells picking up an RBI single, a lead that would hold up until the Raiders plated a run in the bottom of the sixth to knot the score at 1-1. The Green Wave took the lead back in the top of the seventh plating a single run with Ethan Saylor picking up and RBI by way of a hits batman to lead 2-1. Greenville put the game out of reach exploding for seven runs in the top of the eighth inning led by singles from Sells, Kameron West and Tytan Grote, walks to Hayden Bush and Saylor and a Grant Minnich fielder’s choice to give the Green Wave an eight run margin of victory. 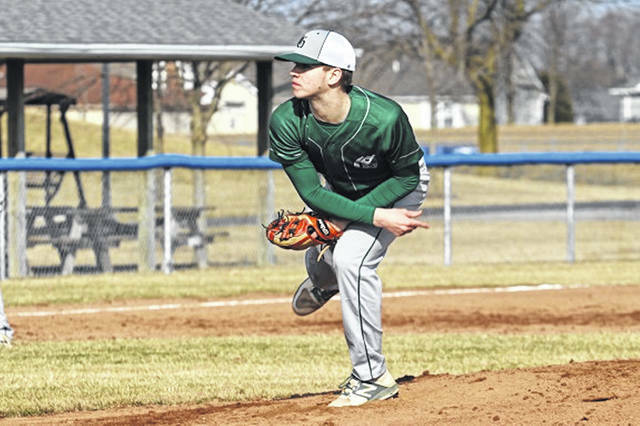 “Reed Hanes toed the mound three innings for the Wave allowing one run, Tytan Grote pitched two innings, and Ethan Flannery and Kole Frances each tossed an inning. Sells, Bush, Minnich, Saylor, West, and Grote each had RBIs in the seventh frame. Greenville banged out eight hits on the day led by Landon Eldridge, Grote and Sells each with two hits to lead the Green Wave offense. Reed Hanes toed the mound three innings for the Wave allowing one run, Tytan Grote pitched two innings, and Ethan Flannery and Kole Frances each tossed an inning. Reach Gaylen Blosser gblosseraimmediamidwest.com or 937-548-3330.